Exponent of the New Psychology Cause/Cause. New York, NY, then Detroit, MI. Publisher: A.A. Lindsay Publishing Company. Editor: Arthur Adolphus Lindsay. 1/1, February 1938. 18-24 pp, $1.00 a year. Arthur Adolphus Lindsay (1864-1942) was one of the longest-practicing New Thought mages, moving from San Francisco, to St. Louis, Seattle, and Cleveland, and then to Detroit and New York City, where, from a suite at the Ansonia Hotel (later home of Plato's Retreat) and from a similar hotel in Detroit he published this journal and conducted his Society of Soul Culture. He first comes to light in his advertisements in the Hypnotic Magazine in 1897 for his Hypnotic and Mesmeric Institute in San Francisco ("All diseases Amenable to Suggestion and Successfully Treated. Hypnotism and Vital Magnetism Practically and Successfully Taught"), and then was Principal of the St. Louis College of Suggestion. As with many others of his era, Lindsay taught the strength of the "two minds in man": "Written with reference to a department of mind that is Designer, and another the Builder, which brings body, mind and character building to a scientific basis for individual application." The "Objective Mind," the mind of the senses that interacts with the objective world, is the "Designer," the planner, while the "Sub-Conscious Mind" is the "Builder," capable, with appropriate instructions, of making the body and conscious mind into what they should be. Lindsay's contribution to this New Thought truism was his "formulas for Soul Culture"--affirmations under a new name--that functioned by the suggestive imposition of designs for improvement on the sub-conscious mind and the body. He had worked out his ideas by the time he wrote Mind the Builder in 1908 and continued teaching them until his death, presumably teaching favored students the details of his formulas, for a separate fee. 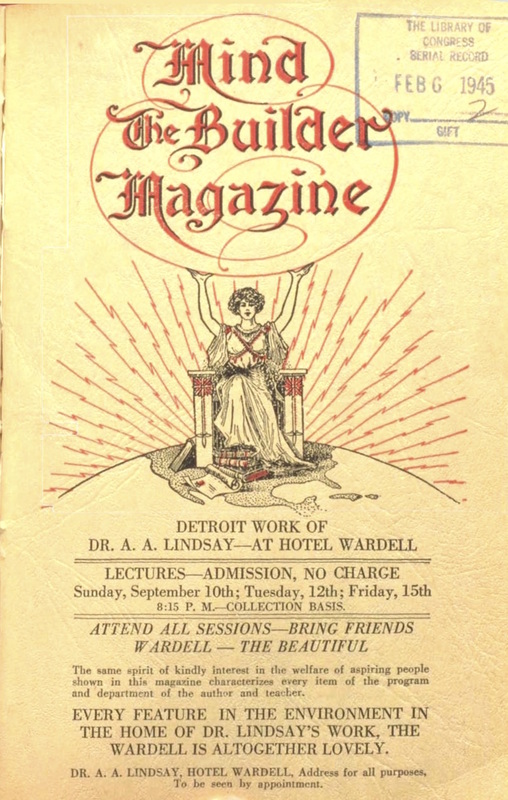 Each issue carried a picture of Lindsay in a scholarly pose, and consisted of a transcript of his latest lecture. The journal was still being published in 1946. On Lindsay, see also the note under Builder Magazine. Harvard University; San Diego State University; University of California Santa Barbara; LOC.